Florida's Largest Collection of Luxury Antique Rugs, Vintage Rugs, Reproduction Rugs, and Tapestries. 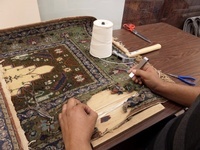 Royal Oriental rug is the Florida's finest purveyor of antique rugs in the world. As you choose from some of the finest Persian, European and Oriental carpets and tapestries in the Florida, feel confident that we provide the highest standard of quality and commitment to excellence. Giving each and every client a sense of trust and assurance is a philosophy that has become a Royal Oriental Rug trademark. This is just a glimpse of our vast collection, please contact us with your special request at 813-601-3829 or contact royalorientalrug@gmail.com to receive more information about our extensive collection.